If you’re shopping for a new mattress, you may have noticed that memory foam and latex are both advertised as body-contouring materials – but which one is better? A good quality mattress can last up to 10-15 years, so investing in the right type can make the difference between years of healthy and comfortable sleep or restless tossing and turning. Though many retailers sell latex and memory foam mattresses, few can provide you with the details of how these materials are made and how they affect your sleep. To help you find the best mattress for your sleep style, we’ve pinned these two common mattress types against each other for comparison. So, which is better? Go on, keep reading. One of the major differences between memory foam and latex is that memory foam is an entirely synthetic material, while latex can be found in both natural and synthetic blends. Natural latex is a popular mattress choice for those looking for an organic option, as it is made from rubber tree sap and is considered a highly durable and expensive material. Synthetic latex, on the other hand, is much more affordable but includes added carcinogens. Both natural and synthetic latex can be created through the Dunlop and Talalay processes. 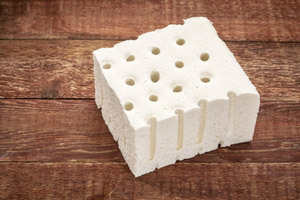 The main difference between the two is that Talalay latex is usually softer, lighter, and yields more than Dunlop latex, while Dunlop is firmer, denser, and provides more support. As opposed to latex, which is rooted in nature, memory foam is based on science. In fact, this synthetic, polyurethane-based material was invented by NASA. This material can conform to your body due to a chemical reaction that softens the foam when it encounters your natural body heat. This eliminating the need for springs and other materials that could cause uncomfortable pressure points in your mattress. Both latex and memory foam mattresses have had outstanding consumer responses, but depending on your sleep style, one may be better than the other. For those who are looking for ultimate soft comfort, memory foam may be better due to its ability to instantly conform to your body and its elimination of pressure points. For side sleepers, the body contouring can also be a huge advantage as it is able to support healthy spine alignment. Memory foam is also a great option for those who are restless sleepers (or who have restless sleeping partners) because the indentation slightly lodges the body in place, preventing uncomfortable tossing and turning throughout the night. However, a downside of this factor is that if you do want to change positions during the night, it might take a few minutes for the mattress to reshape itself and you may find yourself sliding into the old indent in the meantime. Latex mattresses, on the other hand, are known for being generally firmer than memory foam mattresses, meaning that they are a better choice for those who prioritize firm support over soft comfort. Depending on whether you are dealing with Dunlop or Talalay latex, this will also affect the buoyancy and comfort. Natural latex mattresses are sometimes considered the healthier (and eco-friendlier) choice because of their natural formulation and resistance to dust and other allergens. In contrast, memory foam is a synthetic blend that is prone to dust-absorption and emits a chemical off-gassing – which, in some studies, has been found cause respiratory irritation. It is also important to keep in mind that synthetic blends (like memory foam and synthetic latex) may also include added chemicals and flame retardants that are considered known carcinogens. In fact, even some mattresses that are marketed as “natural latex” may only have a thin layer of the natural blend and largely consist of synthetic additives underneath. Manufacturers sometimes do this because 100% natural latex is much more expensive. For the health-conscious consumer, however, the added durability and health benefits of the organic blend may well be worth the added cost. Both mattress materials have advantages and disadvantages depending on what you are looking for. Memory foam mattresses are a popular choice for those looking for ultimate soft comfort, while latex mattresses offer many benefits for the health/eco-conscious buyer. Considering that you will be sleeping on your mattress every night, it’s good to know the difference between these two materials so that you can invest in the right option for your sleep needs.